1. Transport to the altitude of a space station by means of the special aerospace-plane; further advances into space will use modified spacecraft. 2. Ascent of the aerospace-plane according to the principle of minimum energy expenditure. 3. Descent of the craft as a glider, without energy expenditure. Sänger was told by one of his instructors that if he tried to get a doctoral degree in spaceflight, he would most likely be "an old man with a long beard before you have succeeded in obtaining your doctorate." Sänger abandoned his original paper and submitted a more conventional paper for his degree. But he didn't forget what he really wanted to do. 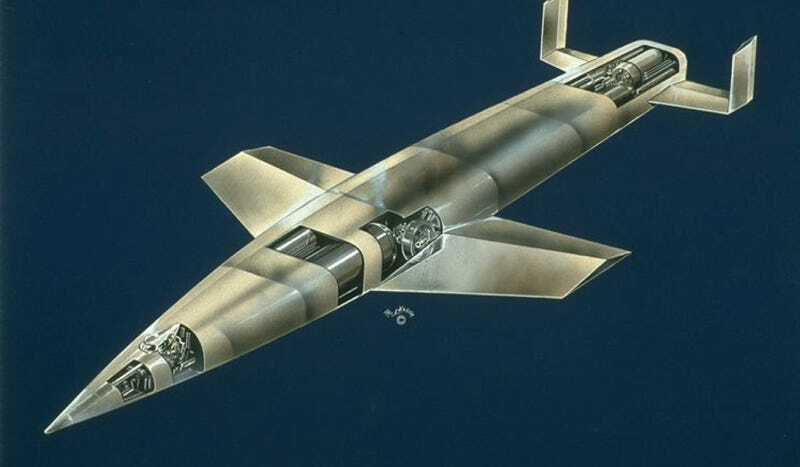 Three years later Sänger began developing a semi-ballistic rocket plane in serious detail. But he kept his project secret until the beginning of February, 1933. The plane he described largely resembled a conventional aircraft, though propelled by a gasoline-liquid oxygen rocket motor. It would reach a velocity of 6,200 mph (Mach 10) and fly at altitudes between 37 and 43 miles. It was smoothly streamlined, "pointed in front and blunt at the back-end to give room for the exhaust. The profile of the wings has to be as thin as possible, with sharp leading edges. The wing span can then be kept short because of the negligible resistance of the wing edges." Sänger might easily have been describing the X-15 research plane of the 1960s. After eleven publishers rejected Sänger's manuscript, "Raketenflugtechnik," it was finally published but only after Sänger first contributed an exorbitant fee toward the costs. It took him four years to pay off the debt of printing what is now regarded as one of the founding classics of modern astronautics. In October, 1933 Sänger submitted a proposal for his rocket bomber to the Austrian Ministry of Defense. Although he published a sketch of what such a rocket bomber might look like, Sänger purposefully did not go into definite structural details. However, he predicted that a " . . . 5,000-kilometer flight will take place in about 5,000 seconds or at an average cruising speed of 1,000 meters/second or 3,600 kilometers/hour." Between 1938 and 1939 Sänger and his wife, Irene Bredt, continued to work on the antipodal bomber. In October, 1938 a steel model of Sänger's Silver Bird was constructed for testing. The antipodal rocket plane now had the form of a plano-convex hull: its underside was perfectly flat. On the basis of this research, Sänger applied for a patent on the proposed half-ogival fuselage and wedge-shaped wing profile. The Silver Bird was given the far less elegant nickname of the "flat iron," by Sänger's assistants, because of its curved upper side and flat bottom. By August, 1943 Sänger and Bredt had a finished design. In their report Über einen Raketenantrieb für Fernbomber (A Rocket Drive for Long-Range Bombers—completed in 1941) they described the final form of the Silver Bird. It would be an earth-orbiting, single-stage rocket plane with a launch weight of 100 tons (including 90 tons of payload and fuel). Its liquid fuel engine will produce 100 tons of thrust. It would reach altitudes of up to 186 miles carrying a payload of 4 tons into orbit. It would be able to reach such extremely long ranges by a technique Sänger had developed called "skip flying." The spacecraft would literally be skipping off the denser layers of the atmosphere like a flat stone across a surface of water. In this way he would be able to achieve ranges several times those obtainable by mere aerodynamic descent. The rocket bomber will differ from present day propeller-driven aircraft in the following essential points: in place of the propeller propulsion from the fuselage front it has the rocket propulsion in the fuselage stern; the fuselage is in the shape of a bullet with tapered hind part, the wings have a thin wedge-shaped profile with sharp leading and trailing edges and high wing loading at the start of the flight; the cabin is constructed as an airtight stratosphere chamber. The space plane was similar to the one described in 1938. It was 91 feet long, 11.8 feet at its widest point, 7.5 feet wide at the engine opening. Its wingspan was 50 feet. It had a single horizontal tail plane, with a vertical stabilizer at either end. The stubby wings were knife-edged and had a triangular cross section. It had retractable tricycle landing gear, a pair beneath the wing roots and one at the nose. A single pilot sat in a pressurized cabin. Visibility would be poor, only side-view slits and a periscope-like arrangement would allow the pilot to see out. A detachable window cover could be jettisoned during landing for a forward view. In the middle of the plane was the bomb bay, able to hold bombs of up to 30 tons. It would be brought up to its takeoff speed of 1,640 ft/sec by means of a catapult. This took the form of a liquid-fueled rocket-driven sled—-essentially a V-2—-on a horizontal track. After this boost, it would continue on into earth orbit under its own power. The rocket plane would then skip across the upper layers of the atmosphere, dropping its bomb at any one of the low points, such as Manhattan, and then continue on around the world back to its launch site, where it would land. Fortunately for New York City the antipodal bomber never got off the drawing board. But it's story wasn't over with the end of the war. If anything, it got even stranger. This V2 is not what we want . . . We must work on the development of long-range rockets. The importance of Sänger's project must be seen in the fact that it can fly very long distances. And we certainly cannot wait until the American imperialists add Sänger's rocket-plane to their B-29 and Atom Bomb. V. F. Bolkhovitinov and G. A. Tokady discussed the merits and shortcomings of the Sänger scheme. For the former, it seemed to be no more than an enlarged version of his Bl-1 rocket fighter. Why not, he asked, put something like the BI-1 on top of a multi-stage rocket? "Besides," he continued, "Should man ever succeed in putting a satellite round the earth, he will have to find a method of bringing it down, and here again wings may prove to be good." A meeting was held at the Kremlin on March 14, 1947. Among those in attendance were G. M. Malenkov; M. A. Voznesensky, head of the Statc Planning Commission; D. F. Ustinov, second secretary of the CPSU; Air Marshall K. A. Vershinin; Colonel G. A. Tokady; T. F. Kutzevalov; Aleksandr Yakovlev and Arlem Mikoyan, both aircraft designers; and M. V. Khrunichev, minister of aircraft production. Tokady criticized the scheme, but it was nevertheless forwarded to Stalin. Special Commission Number 2 was immediately established, which included the still-doubting Tokady. The commission went to Berlin to see if further information could be found there, but by August it had failed to uncover any new data. The Antipodal Bomber report was then turned over in October to the Ni-88 Scientific Research Institute where captured German scientists were set to work on the problem. Their conclusions, like Tokady's in the beginning, criticized the bomber's optimistic engine specifications, need for high structural strength and requirements for heat shielding. They deemed the project unfeasible. So they suggested their own version of the Sänger bomber. The NII-1 would have been a manned intercontinental rocket created by adding ramjets to the wingtips of the Sänger antipodal bomber. Like the Nazi space bomber, the Soviet one never left the drawing board, either. But there was a lot of life left in Sänger's idea. In the early 1950s, Bell Aircraft designed an orbital rocket plane dubbed "BOMI" (for BOmber MIssle), which drew directly from Sänger's work. Like the Silver Bird, it would skip-glide its way back to a landing on earth. BOMI was in turn the direct ancestor of the Dyna-Soar space plane, which in turn was a predecessor of the Space Shuttle. Meanwhile, the Russians weren't finished with Sänger by a long shot. In 1955 Life magazine published a description of a possible Russian "Intercontinental Ballistic Vehicle" or IBV—- distinguished from an intercontinental ballistic missile by virtue of being manned. Based on the skip-glide principles developed by Sänger and Bredt, the Russian IBV would be launched horizontally from a rail-mounted carriage, boosted by two huge strap-on solid-fuel rockets. It would carry a single pilot in a pressurized cabin. In the first 5 seconds it would reach a speed of 530 mph. The 66-foot space plane would have its own 60,000-pound-thrust rocket motor. The boosters would burn for 37 seconds and be jettisoned at 38,000 feet. The space plane would then travel the 7,150 miles from Moscow to New York, a skipping across the upper atmosphere of the earth just as Sänger's Silver Bird would have. After dropping an atomic bomb, it would continue on to a landing in the Pacific Ocean where it would be recovered by a submarine. Sänger planes and their construction should be our immediate objective . . . Tokaev, we wish you to exploit Sänger's ideas in every way . . .
Tokady was eventually given the task of arranging the kidnapping of Sänger and Bredt from Paris—where they had fled following the war—to the Soviet Union, a fate the couple just narrowly escaped. Sänger's work laid the foundation for not only the Space Shuttle but virtually every space plane design developed in the past fifty years. During the 1960s and 1980s, German aerospace firms briefly revived the Sänger concepts, adapting them into spectacularly new space plane designs, though, sadly, they were all ultimately abandoned. One influence of the Silver Bird, however, is familiar to every scifi fan. The Orion space plane in 2001: A Space Odyssey was deliberately designed to be a tip of the hat to Eugen Sänger and Irene Bredt's fabulous vision.